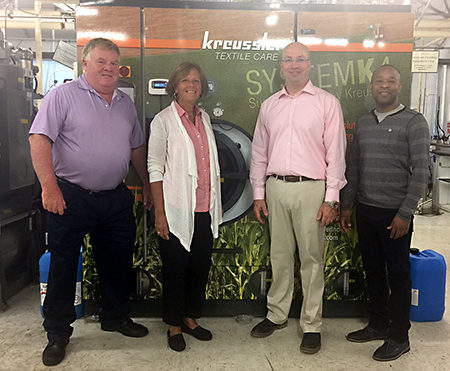 Tom McAllister, Kreussler TSR, Mary Scalco, DLI CEO, Richard Fitzpatrick, Vice President of Kreussler Inc., and Brian Johnson, DLI Director of Education & Analysis stand before the donated cleaning machine. 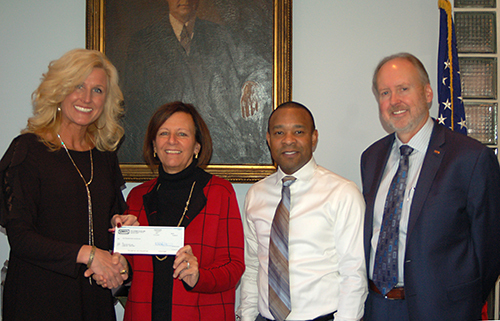 Kreussler is sponsoring seven scholarships to DLI’s School of Drycleaning Technology totaling $10,000 in 2018. DLI will award one of the new scholarships for each of its 2018 courses and Kreussler will award the rest to customers. Scholarship recipients must be members of DLI or join as members of the Institute to receive the assistance.